SideTerms is a browser add-on whose goal is to enhance the functionality of the search engines you use. The program is distributed by Alactro LLC and is compatible with Internet Explorer and Mozilla Firefox. Interestingly, the official website of the program does not contain the installer for the program, which means that this browser add-on can only get onto your computer through other ways. 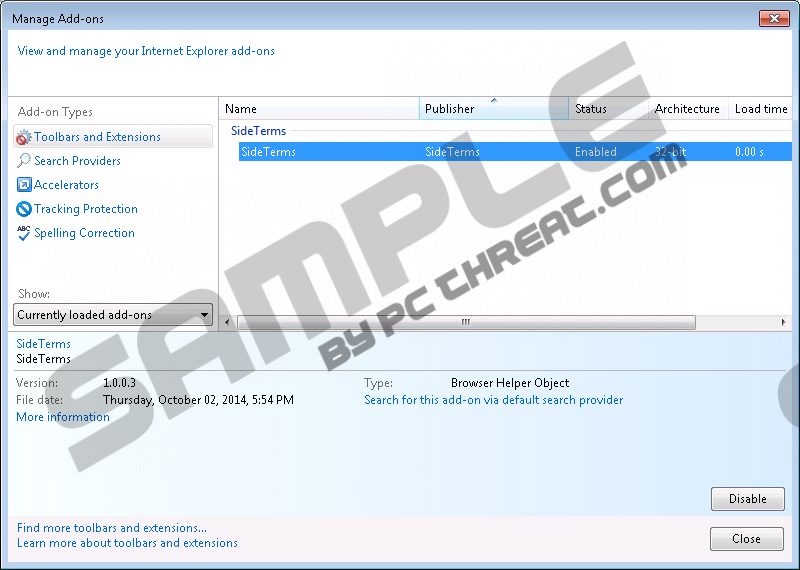 The SideTerms browser-add is regarded as adware and can be removed from a computer by certain security programs. The reason why the program falls into this category is the fact that it displays third-party advertisements. SideTerms ads are displayed on the left side of the browser windows. Those pop-ups feature the name "SideTerms" and also the label “Related.” The content provided is supposed to be related to your browsing interests, but the odds are that you will find those SideTerms pop-ups very annoying. We recommend that you remove SideTerms from your computer, and the sooner you take action to eliminate the program, the better. SideTerms should be removed as soon as possible because it is capable of collecting personally and non-personally identifiable information. The SideTerms program collects information in order for the creators and third parties to understand how you use the program and then use that knowledge to enhance the performance of the program. It is not surprising that SideTerms collects information about This characteristic is typical of many advertising-supported programs, and you should bear in mind that you can be monitored by various free programs. SideTerms collects information concerning your browsing behavior and computer, including your IP address, browser type, usage patterns, and other details. If you choose to contanct the team of SideTerms, some personal information, such as your name and email address, is recorded. If you have no intention of using the service provided by SideTerms, remove it from the computer right now. It is important to note that your interaction with SideTerms pop-up content may lead to adverse consequences, because SideTerms is not liable for the activities of third parties. Hence, we advise you against using this program. Our instructions below should help you uninstall SideTerms, but our clear advice is that you rely on a powerful malware and spyware removal tool so that you can be protected against malware and spyware threats. Use SpyHunter, which offers real-time protection against multiple threats, and forget about the danger that you can encounter while browsing the Internet. If you have any questions, feel free to contact our team for advice. Select the Control Panel option in the pop-up window. Quick & tested solution for SideTerms removal.